1. 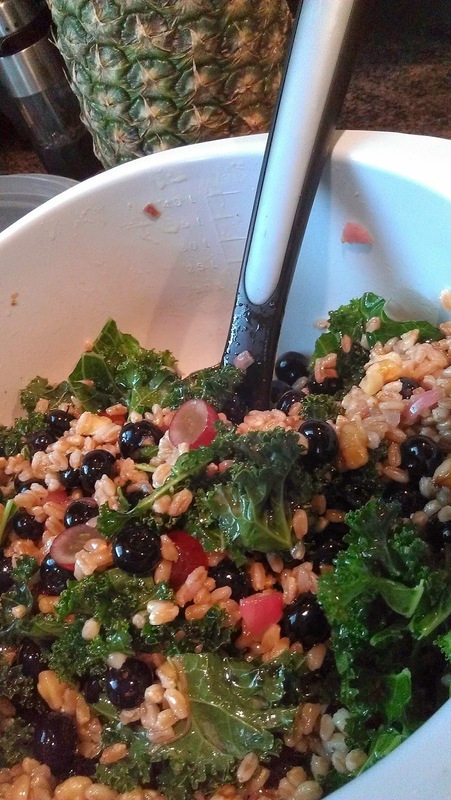 Bring wheat berries, salt, and 4 cups water to a boil in a saucepan. Cover, reduce heat to low, and simmer 1 hour. 2. Meanwhile, cook peas in boiling salted water to cover 2 minutes or until crisp-tender; drain. Plunge into ice water; drain and pat dry. Slice in half. Drain wheat berries; rinse under cold water until cool. 3. 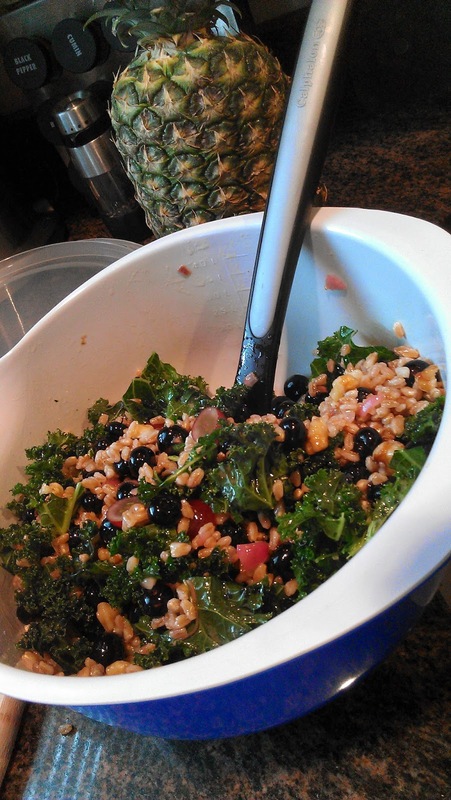 Toss together kale, wheat berries, and 1/4 cup vinaigrette in a large bowl. Let stand 30 minutes. Stir in blueberries, pecans, and sugar snap peas. Add salt and pepper. Sprinkle with cheese. Serve with remaining vinaigrette. Stir together red wine vinegar and minced shallot; let stand 10 minutes. Whisk in olive oil and remaining ingredients. Add salt and pepper to taste. Refrigerate in an airtight container up to 1 week. Recipe from Southern Living's july-2014-recipe-list. In a wide, deep saucepan with a cover, heat the olive oil over low-moderate heat. Add the shallots and cook until softened, about 5 minutes. Add the garlic, rosemary, and red pepper flakes and cook, stirring, for about a minute. Add the beans and cook for 5 minutes, stirring occasionally. Add the kale, cover the pan, and cook, stirring occasionally, for about 5 minutes or until the kale is soft. Stir in the lemon juice, and season to taste with salt and pepper. To serve, slice each sweet potato lengthwise and push on the ends to open up the middle. Spoon the beans and greens into the center. Yields 5 servings. Total time 30 minutes. In a saucepan, bring quinoa and 2 cups chicken broth to a boil. Cook approximately 15 minutes, until quinoa gets a little translucent. Once done, transfer to soup pot on stove. While making quinoa, skin, bone and shred the chicken. 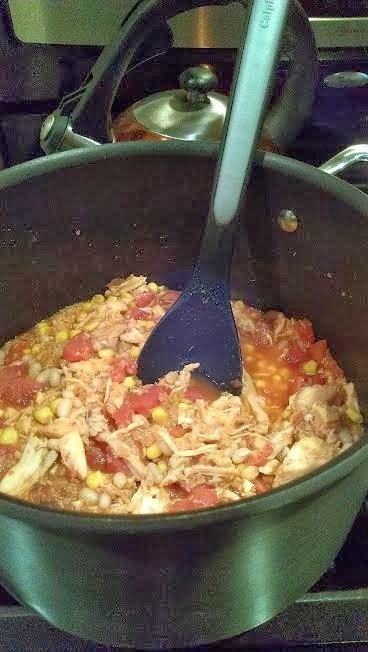 Put the chicken in soup pot, along with diced tomatoes, remaining cup chicken broth, navy beans and sweet corn. Simmer until heated through. Serve with any of the optional add-ons. 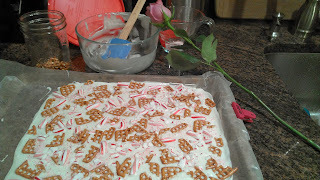 Notes: recipe is an adapted version from confections of a foodie. Steam the butternut squash until barely tender, about 10 minutes. 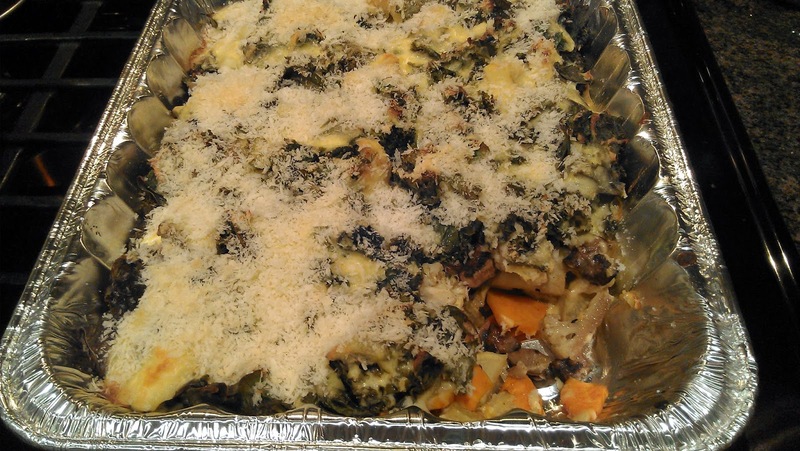 remove half of the squash pieces + set aside. In a large saucepan set over medium heat, add the olive oil. add the onion + cook, stirring occasionally, until onion is starting to turn golden, 8 to 10 minutes. add the minced garlic + oregano – cook, stirring, for 1 additional minute. 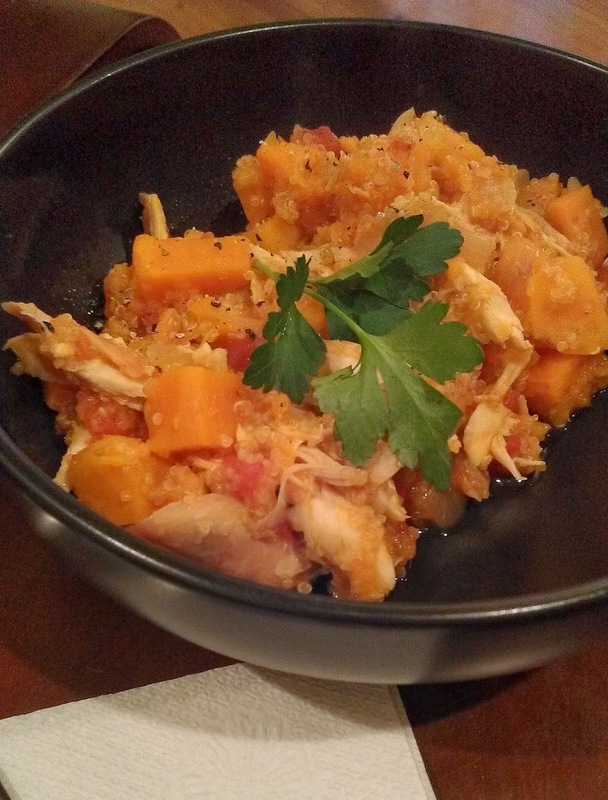 Add the diced tomatoes, butternut squash pieces, mashed butternut squash, chicken broth, + quinoa. stir to combine. bring to a simmer, cover + cook until the quinoa turns translucent, about 15 minutes. add the shredded chicken, kalamata olives, + salt + pepper. simmer, uncovered, until chicken is heated through + sauce has thickened to your liking. for me, this took about 10-15 more minutes. add more Salt/pepper if needed, to taste. Garnish with the fresh parsley + serve. Recipe & picture from Southern Living. It does come out exactly like picture. 1. Preheat oven to 350°. Heat oil in a 10-inch (2-inch-deep) ovenproof nonstick skillet over medium-high heat. 2. Add garlic, and sauté 1 minute. Stir in spinach, and cook, stirring constantly, 1 minute or just until spinach begins to wilt. 3. Add tomatoes and green chiles, salt, and pepper, and cook, stirring frequently, 2 to 3 minutes or until spinach is wilted. Add eggs, and sprinkle with cheese. Cook 3 to 5 minutes, gently lifting edges of frittata with a spatula and tilting pan so uncooked portion flows underneath. 4. Bake at 350° for 12 to 15 minutes or until set and lightly browned. Remove from oven, and let stand 5 minutes. 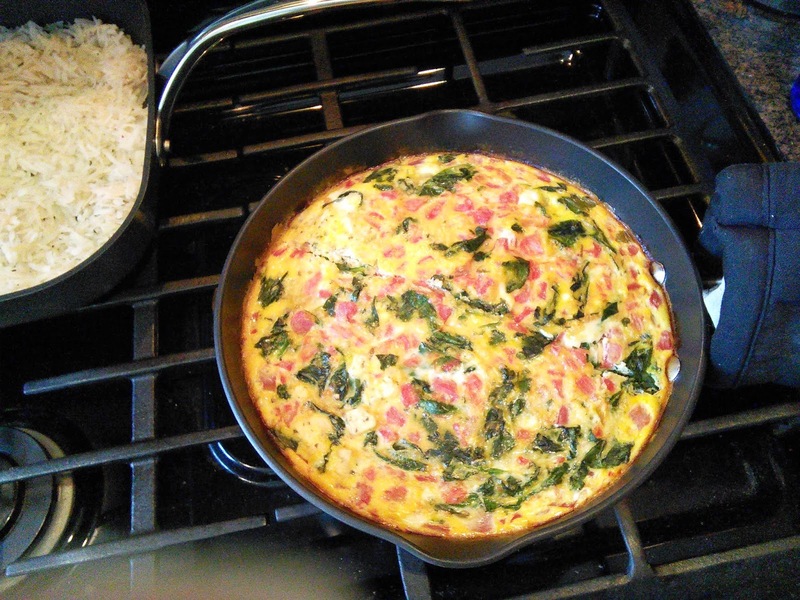 Slide frittata onto a large platter, and cut into 8 wedges. *1 (32-oz.) carton egg substitute may be substituted. Increase bake time to 16 to 18 minutes or until set. Note: We tested with Ro-Tel Mild Diced Tomatoes and Green Chilies. 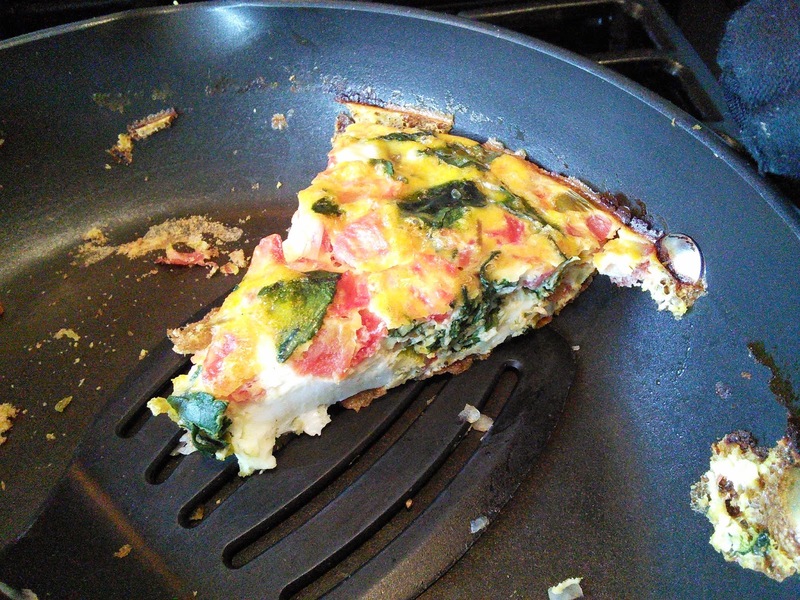 Tomato-Sausage Frittata: Brown 1/2 lb. ground pork sausage in a 10-inch (2-inch-deep) ovenproof nonstick skillet over medium-high heat, stirring often, 7 to 8 minutes or until meat crumbles and is no longer pink; remove from skillet, and drain. Wipe skillet clean. Proceed with recipe as directed, adding sausage with tomatoes and green chiles in Step 3. Hands-on time: 34 min. ; Total time: 51 min. Bacon-Mushroom Frittata: Prepare recipe as directed in Step 1, sautéing 1/2 cup sliced fresh mushrooms in hot oil 2 to 3 minutes or until browned. Proceed with recipe as directed, stirring 3 cooked and chopped bacon slices in with tomatoes. Hands-on time: 24 min. ; Total time: 46 min. Eggplant-and-Olive Frittata: Prepare recipe as directed in Step 1, sautéing 1 cup peeled and chopped eggplant 5 minutes or until tender. Proceed with recipe as directed, stirring 1/2 cup sliced black olives in with tomatoes. Hands-on time: 32 min. ; Total time: 49 min. Preheat oven to 425 degrees. Divide sweet potatoes and garlic between 2 rimmed baking sheets. Drizzle with 3 tablespoons oil; season with salt and pepper. Toss to coat and spread into a single layer. Roast, flipping once, until tender and caramelized, about 30 minutes. Meanwhile, cover farro with 4 inches water in a medium saucepan. Bring to a boil, then reduce heat and cook until tender, 30 to 35 minutes. Drain; toss with remaining 2 tablespoons oil in a large bowl. Season with salt. When cool enough to handle, remove garlic from peels and mash with lemon zest and juice in a small bowl. Add garlic mixture, sweet potatoes, dill, and sprouts to farro; stir until combined. Season with salt and pepper, and garnish with sprouts. 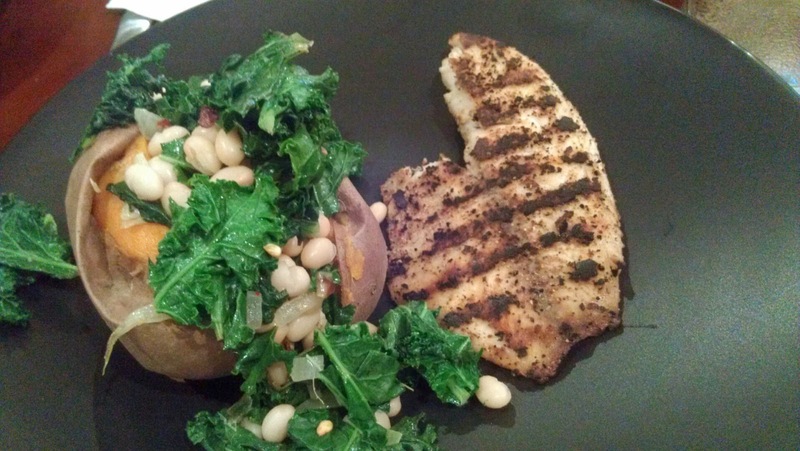 Keep the skins on sweet potatoes to save time, fiber, and nutrients. When roasted, skins offer a great textural contrast to the creamy flesh. From Martha Stewart's December 2013 Magazine. Recipe is a little dry. Maybe need to add butter or olive oil to lemon garlic sauce. 1. Preheat oven to 475°. Toss together cauliflower, mushrooms, 2 1/2 Tbsp. oil, 1/2 tsp. cumin, 1/2 tsp. salt, and 1/8 tsp. pepper in a medium bowl. Spread cauliflower/mushroom mixture in a single layer in jelly-roll pan. 5. 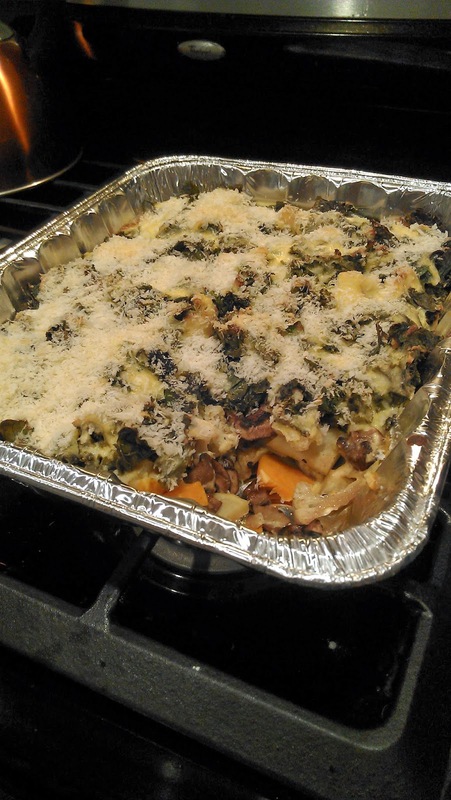 Layer half each of sweet potatoes, cauliflower mixture, beans (if desired), kale, and 1 1/2 cups Easy Cheese Sauce in a lightly greased 13- x 9-inch baking dish. Repeat layers once. Top with remaining 1/2 cup cheese sauce. Stir together panko, chopped cilantro, and olive oil, and sprinkle crumb mixture over casserole. Note - I only did one layer of each. 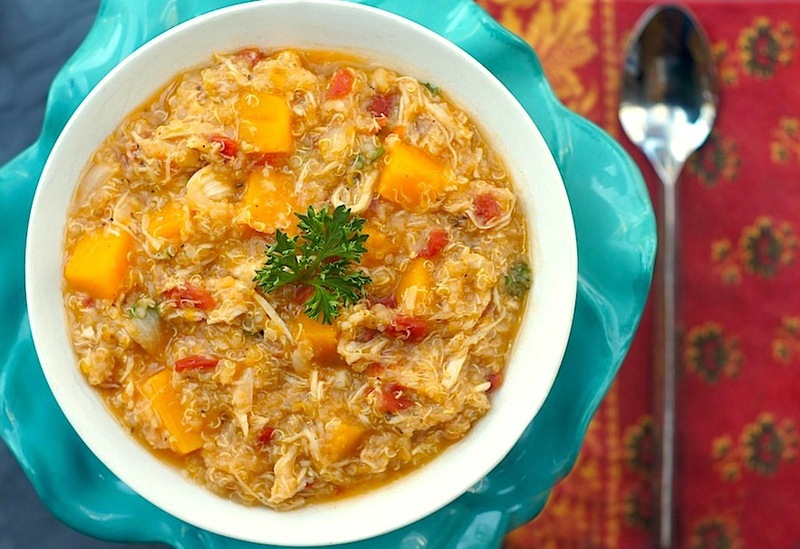 Recipe from Southern Living's January 2014 issue. 1. 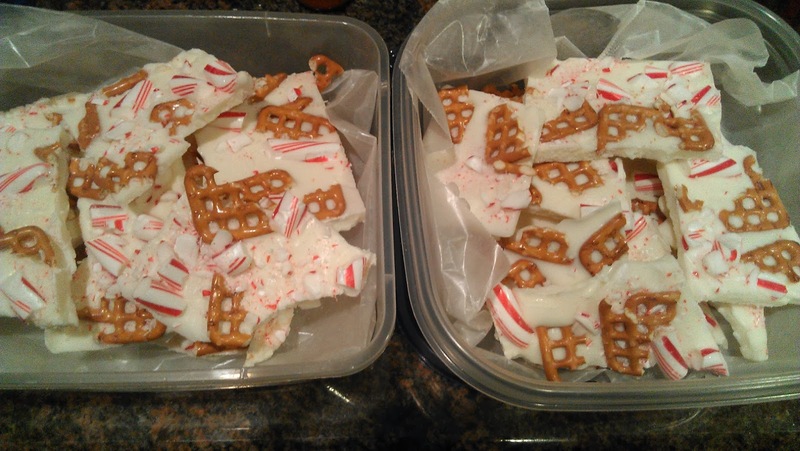 Microwave candy coating in a 1-qt. microwave-safe glass bowl at MEDIUM (50% power) 1 minute; stir. Microwave until melted and smooth, stirring at 30-second intervals. Stir in peppermint extract. 2. Spread half of melted candy coating about 1/8 inch thick in a parchment paper-lined jelly-roll pan.You can use a soft rubber spatula to smooth out the coating on the pan. 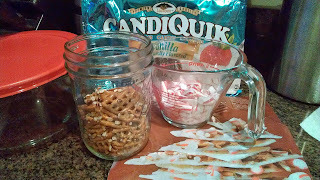 Sprinkle 1/2 cup chopped pretzels and 1/3 cup chopped candy canes over melted candy coating, and press into coating. Repeat procedure with remaining ingredients on another parchment paper-lined jelly-roll pan. Chill 5 minutes or until cool and firm. Break into pieces. 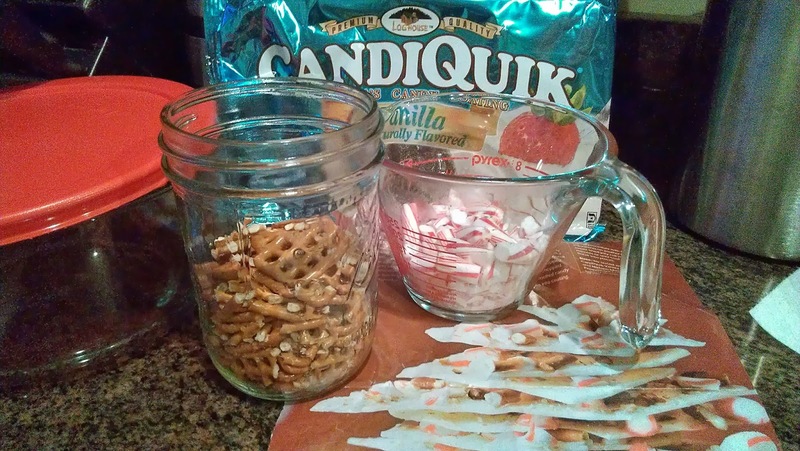 Here are a couple more cool Log House CandiQuick recipes that are ready in 30 minutes or less: Heart Candies (or any other shape cookie cutters you have) and St Patty's Pretzel Rods. 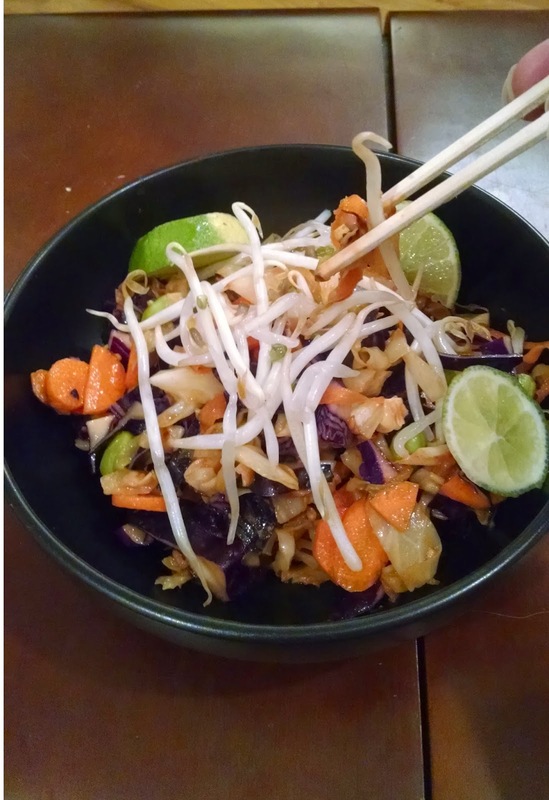 You can support this blog by purchasing from the links in the ingredients section.